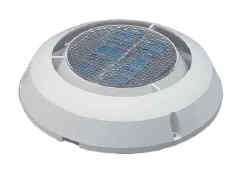 The MiniVent 1000 is the smallest and most economical solar vent in the Marinco line. At just 7" in diameter and approximately 1-3/4" high, the MiniVent 1000 is compact yet effective. This solar powered model is an exhaust vent only. It will keep the boat cabin cool when you need it most, during the hot sunlight hours. Under solar power, the Mini Vent 1000 will move 700 cubic feet of air an hour. At night, even a light breeze will continue to ventilate the boat passively. Built-in shut-off damper prevents water intrusion in rough seas. Fits a 3-3/4" diameter installation hole. The vent can be retrofitted to an existing hole of up to 6" in diameter. Available in white ABS plastic or stainless steel. Optional stainless steel cover is also available separately. All MiniVent 1000 models come complete with white plastic interior trim ring, mounting hardware and an easy-to-understand installation manual.